A Group 3 winner in open class 5 wins 1000-1200m including Gr. 3 WATC Colonal Reeves Stakes. ♦ HOBART JONES ♦ Group 2 Karrakatta Plate winner, now four wins 8 places $551.050. 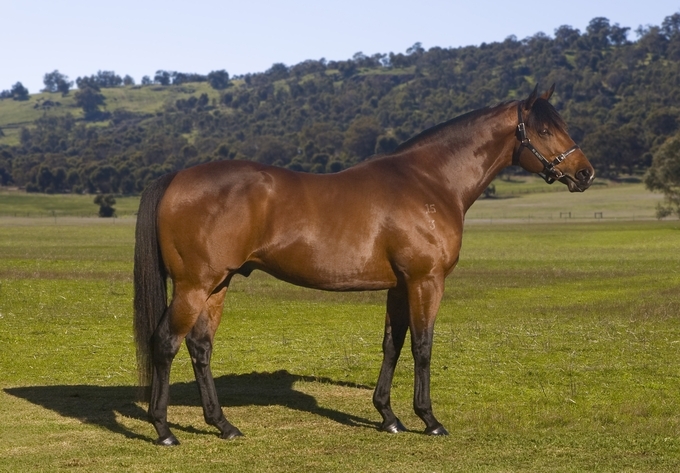 Placed in WA Sires Produce Stakes G3, Sir Ernest Lee Steere Classic G3, Listed Perth Stakes. ♦ COULEUR BIZARRE ♦ Listed Winner Bunbury Cup 2018 now 6 wins 17 places $359,160. MEGATIC (dam by Old Spice; grandam by Captains Wings). 6 wins, $650,300, WATC Kingston Town Classic-G1, West Australian Guinneas-G2, Belgravia S-LR, 2d WATC Fairetha S-LR. ROMAN TIME (Is It True; Raffindale). 3 wins, $483,950, WATC Karrakata P-G2, West Aust. Sires Produce S-G3, Purified Ice H.
SO SECRET (Bletchley Park; Haulpak). DARK TARGET (Protos; Jevington). 8 wins, $389,950, WATC Prince of Wales S-G3, Fairetha S-LR, 3d WATC Winterbottom S-G2. MY TIME (Todvega; Tudor Warning). 3 wins, $119,700, WATC Placid Ark S-LR, 2d WATC Belgravia S-LR. FAMOUS ROMAN (Marooned; Balkan Knight). 5 wins, $263,300, WATC R J Peters S-G3, Aquanita S-LR, 3d WATC Asian Beau S-G3. DANEBEELA (Tenby; Beau Sovereign). 5 wins, $253,525, WATC WA Champion Fillies S-G3. DANERIP (Rory’s Jester; Swooping). 3 wins, $119,975, WATC Gimcrack S-LR, Paklani Plate. MY TIME (Todvega; Tudor Warning). Won WATC Placid Ark S-LR, 2d WATC Belgravia S-LR. COVERTLY (by Metal Storm). 6 wins, $764,840, WATC Railways S-G1, WA Sires Produce S-G3, Crystal Slipper S-LR, N J Way S-LR, 2d WATC Lee-Steere S-G2, WATC Gimcrack S-LR, 3d AJC Flight S-G1, STC Tea Rose S-G2, 4th WATC Kaarrakatta P-G2, AJC Silver Shadow S-G2. SECRET LINK (by Encosta de Lago). 6 wins, $134,955, WATC December S-LR, 2d WATC Dayana S-LR, Belmont Guinneas-LR, 3d WATC Belmont Sprint H-G3. Siesta Park (by Seignorial). 5 wins, $139,660, 2d WATC Burgess Queen S-LR, 3d WATC Matchmaker S-LR, 4th Belmont Oaks-LR. Most Secretive (by Danetime). Winner, 3 year old Handicap, 1000m Belmont.